﻿For their elegance and demonstration of the basic physics of flight, kites have been an expression of man's desire for flight and appreciation of the elements. 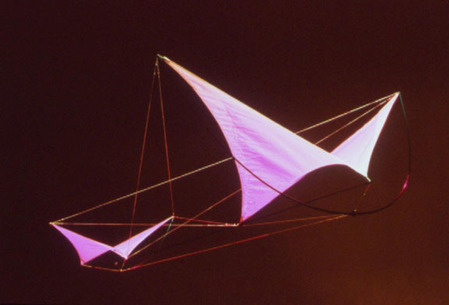 GuildWorks' origins are in the art of kite construction. Kites embody the dynamics of beauty, form, tension, movement﻿. Dynamic and sculptural in design, Synergetic Series Kites are optimally three-dimensional, featuring a state-of-the-art Tensegrity framework combined with a tension-suspended, aerodynamically-shaped sail. 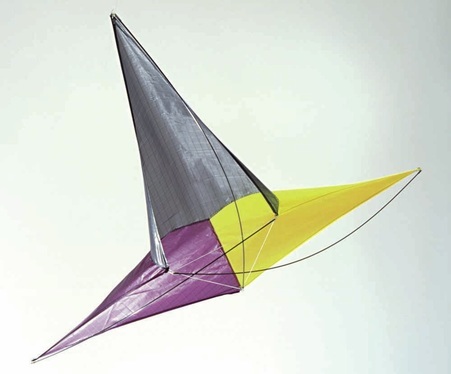 The Tensegrity framework of the kite forms one of the primary differences between the Synergetic Series Kites and other kites. Tensegrity, short for tensional integrity, is a system where the spars do not touch each other, but are suspended in a continuous network of integrated tension lines. Tensegrity is one of the lightest yet strongest structural systems known (which is why it makes a great kite structure!) Another feature of the Synergetic Series Kites is their exceptional durability. So, while your Synergetic Series Kites look elegant, even delicate... for their size and weight, they are by far the strongest kites on the market. The Synergetic Series Kites are specifically engineered to withstand high-impact crashes and heavy wind loads. If a Synergetic Series Kite crashes, the tension lines disperse the stress equally throughout the kite, while allowing freedom of motion between the spars in order to relieve the stress. Synergetic Series Kites give you the stability and flexibility you need for performance, plus the resiliency you want for durability.